Samsung has its fair share of consumer electronics devices for the masses, with a little bit of everything for someone, regardless of your budget. Well, having great visuals is one thing in the world of entertainment – to have fantastic audio accompany the visuals is another. 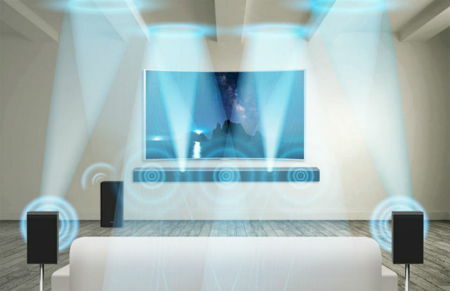 Samsung knows this very well, which is why it has a slew of new audio products to keep the masses entertained at this year’s CES, where among them include a groundbreaking new Soundbar that boasts of Dolby Atmos technology, and enhancements to its Wireless Audio 360 audio series. Specially designed to deliver spectacular sound in order to offer a truly next-generation experience, those attending CES this year can check out Samsung’s new audio lineup for themselves. for starters, Samsung’s new HW-K950 Soundbar happens to be the company’s first to feature Dolby Atmos technology, and it is also the first soundbar package in the industry to come with a couple of Dolby Atmos-enabled wireless rear speakers. On the whole, the HW-K950 package delivers incredible 5.1.4-channel sound despite measuring a mere 2.1” high, where its slim and sleek design makes use of three forward-facing and two upwards-facing speakers in order to deliver a rich, full sound that is big enough to fill the room, yet detailed enough to deliver realistic, cinematic sounds, from an arrow shooting across the room to a hummingbird flying overhead. It will also hook up sans wires to the subwoofer and rear speaker units, making it the perfect, practical and seamless solution in any living room. Based on its Wireless Audio 360 series, Samsung will also show off a new range of colors and patterns for the audios, where they have been specially designed to complement the décor of any room and bring audio content throughout the home. Proprietary Ring Radiator technology will let the audio can be placed anywhere and still fill the room with vibrant, yet balanced sound. Sounds like our ears are in for a treat this CES, right?